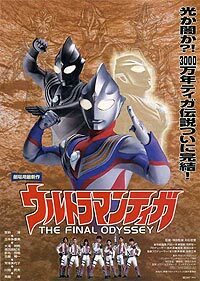 Ultraman Tiga: The Final Odyssey (2000) - Sci-fi-central.com. Japan  2000  .  Starring: Hiroshi Nagano, Takami Yoshimoto, Mio Takaki, Shigeki Kagemaru, Yoichi Furuya, Scott T. Hards, Masaru Matsuda, Risa Saitô, Aiko Tachibana, Takeshi Tsuruno, Mariya Yamada..
Just when we thought that the world is safe, it's under attack again! A TPC excursion (including GUTS' Captain Megumi Iruma) headed to an old ruins and unintentionally woke up three evil ancient giants whom Daigo, later on, has visions of. What's so haunting about his visions is that they're not only three but four evil giants, including Ultraman Tiga in a very dark physique and a very evil aura. After a series of visions, Daigo was able to meet the three evils who beat him up and left the Black Spark Lens to him. Later on, the ultimate battle begins in the ancient ruins. Daigo as Ultraman Tiga, who is supposed to be the warrior of light, must use his powers, however dark, in order to defeat the three evils. Adventures of Ultraman Tiga, and the members of GUTS team continues in this made for a theater movie. The movie has expensive looks and feel to it more than other Ultraman movies, and looks lot like TOHO's tokusatsu movies. Daigo, and Rena are finally tying the knot. In the mean time, Capt. Iruma is on an expedition trip to the remote island of R'lyeh that houses three mysterious Ultraman like stone statues. The expedition is attempting to revive the three stone figures. For some reason Iruma knows that this will cause trouble and tries to stop the expedition team, but fails, and the three giants awakes. They were evil Ultraman from 30 million years ago of whom Tiga was part of. Iruma reverts them back to stone by the power of Uzare. Daigo is now haunted by one of the dark Giants, and is given the power to transform back to the evil Ultraman Tiga. Unlike other Ultraman movies, this movie was not made immediately after, or during the production of the TV series. It's supposedly due to unavailability of Hiroshi Nagano who plays Daigo, and from decision to focus the production budget on the main series. The result seemed to have worked in this movie's favor as well, as all the actors are well rested after 3 years, and the movie seems to have bigger budget to it as well. This movie is extremely well made with excellent plot, and acting. It's certainly one of the (if not the) best movie to come out of Tsuburaya Production, and is highly recommended for viewing. Review by ebiros2 from the Internet Movie Database.